Virtual agents’ reasoning and actions are tightly connected with their awareness ability helping to relate to the environment during a conversation. Researchers invented the combination of virtual reality and artificial intelligence techniques to simulate living conversational agents being aware of themselves, the virtual world around them, and other virtual beings existing in that environment. Conversational virtual humans are nowadays applied to the field of neuroscience, psychiatry and psychology. The technology has evolved to a point where researchers may begin developing mental health applications that make use of virtual reality patients. Human patients with acute neurological illnesses are often confused and unable to cooperate with clinicians during medical consultations. Imagine a simulated training with virtual humans having real mental disorders, willing to talk to their doctors, and sharing their emotions! 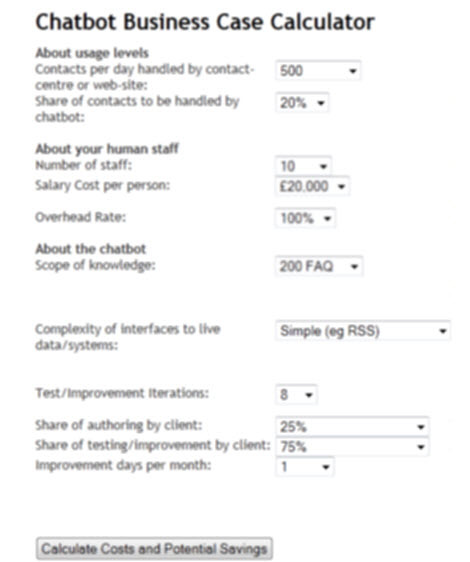 An innovative business case calculator has been created by technology company Daden Limited to help organisations understand the potential savings that using an interactive virtual agent – or chatbot - can deliver. Chatbots are computer applications that can act as a first line of support providing instant responses to questions, without the need for staff intervention, reducing pressure on resources. Available 24 hours a day, seven days a week they can also collect information, provide links to pages and answer queries using natural language conversation, whilst allowing human staff to focus on more complex queries. Research has shown that the average cost-per-contact using a chatbot is under 60p, compared to over £3.50 for live text-chat or over £4 for a telephone contact – almost 84% reduction in costs. But clients often want to know what the actual benefits and savings would be for their own business. Could this virtual human be your friend? Virtual human Spike has its own beliefs and values. Additionally, it exhibits rude, pessimistic and confrontational behavior. Even a very cheerful person is not able to convince this virtual agent to chill out, relax or assimilate optimistic outlook. Would you like that Spike became your conversational friend? Read more about: Could this virtual human be your friend? Chatbots that even a child can enjoy making! Read more about: Chatbots that even a child can enjoy making! VirtuOz, Inc., the leading provider of intelligent virtual agents (IVAs) for online customer service, today announced that Kaspersky Lab, a leading developer of secure content and threat management solutions, celebrates the first anniversary of Lena, an intelligent virtual agent powered by VirtuOz, to provide world-class online customer and technical support. Researchers from Human Centered Multimedia at the University of Augsburg developed a virtual character which is capable of recognizing and displaying the emotion of a user. If there’s one thing I know, it’s that a happy wife makes a happy life. So a few weeks ago when my wife and I welcomed our first child into the world, I wanted to show my excitement and love for our new little addition. The first morning I was headed back to work at Astute Solutions after the baby was born, I decided to call and order flowers to be sent to her – after all, what woman doesn’t love getting flowers? As I navigated traffic, I searched for a florist and placed my call to order. What ensued was a frustrating experience to say the least, particularly because it ended in no flowers for my wife, and no sale for the company. I was immediately greeted with a voice asking me to choose from a variety of options. But while listening to the various menu options and weaving in and out of cars, the frustration began to set in. After pressing “3” for sales, “2” for a mail order, “4” for specialty orders, and “1” to purchase via credit card with no avail, I was fed up. I just wanted to speak to an agent and order flowers. I hung up the phone without speaking to someone and never placed an order. Some might say I’m impatient, but I’m much like everyone else including your customers - busy! And working with customer-focused companies at Astute Solutions, I’m sensitive to customer experience. I just wanted to be able to place my order, and in the absence of an available agent, I would have settled for speaking with a computer. You’re walking down the street and passing by a multiservice kiosk. Would you like a virtual guide to be at your service? This video demonstrates how it could look like - watch it and check for yourself if it’s worth using.